I’ve shortened this down to one of my (sort of) slang mantras: chopping wood and carrying water. It reminds me to be present. My yoga practice relies on many different tools to practice increased presence and awareness. Asana is what started it all for me. Coming from an athletic background allowed me to understand the language of the practice through the body, with breath and concentration. Now, finding discipline to spend more time meditating, saying mantras, sitting in stillness is often necessary to deepen my practice. At the end of October, I was feeling very agitated in my mind. I had a lot of fear and anxiety coming up. 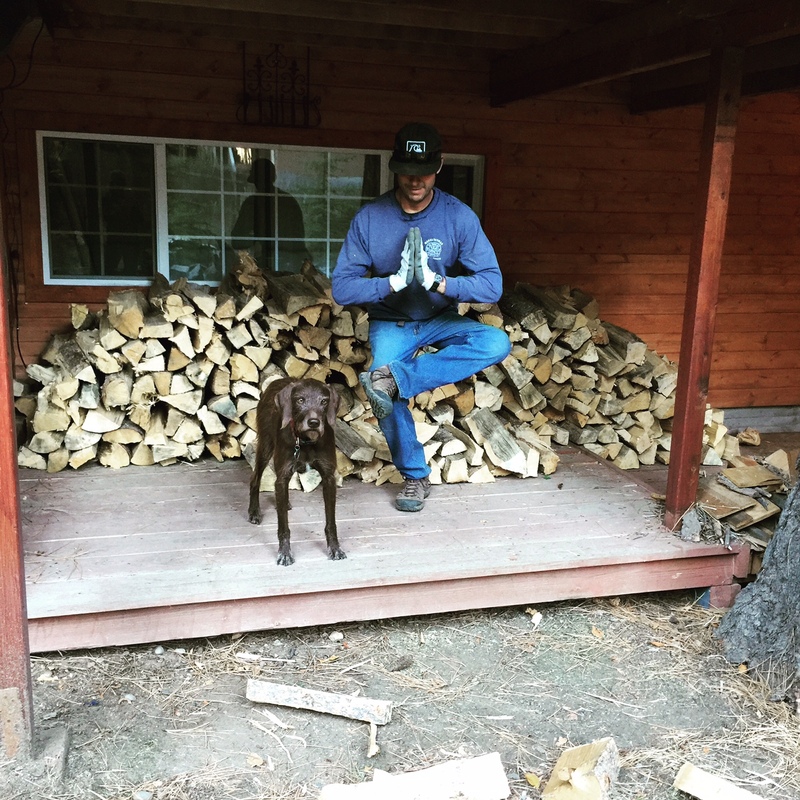 I was applying all of my yoga powers to try to face it with wisdom and grace, but I was not feeling any relief from my stress. I couldn’t sleep at night, and my digestive system began acting up. And then on Halloween, the 31st, my boyfriend and I moved a whole bunch of firewood from a friend’s house to ours. A storm was coming on Sunday, so it was a good time to grab the wood while it was dry. We worked all day, in a steady and rhythmic groove, in a flow. At the end of the day our muscles were tired, we felt spent and ordered pizza and drank beer. The next morning we woke up and got back to work, this time we had a trailer to use and already had become more efficient in how we moved the piles. I was feeling the exhilaration of being back in my body and less in my head. There was finally relief to the drone of negative anxiety that had been plaguing me. I could breathe again. Moving stacks of wood. All day. Carrying. Loading. Unloading. Stacking. Chopping wood and carrying water. We stacked the very last bit of wood just as the raindrops began, before a big snow. United in a common goal of staying warm for the winter and making our work as fun as possible, it was great way to spend time with my boyfriend. We even did some yoga along the way including: handstands against trees, downward dogs leaning on the truck’s tailgate, chest openers and shoulder stretches, deep breaths and even some belly-laughs. Yoga powers come in all shapes and forms. Deep and subtle spiritual healing can take place when we are open to the variety of opportunities that might present themselves like cleaning, washing dishes, laundry, chopping vegetables, conserving water, breathing and meditating with it all. 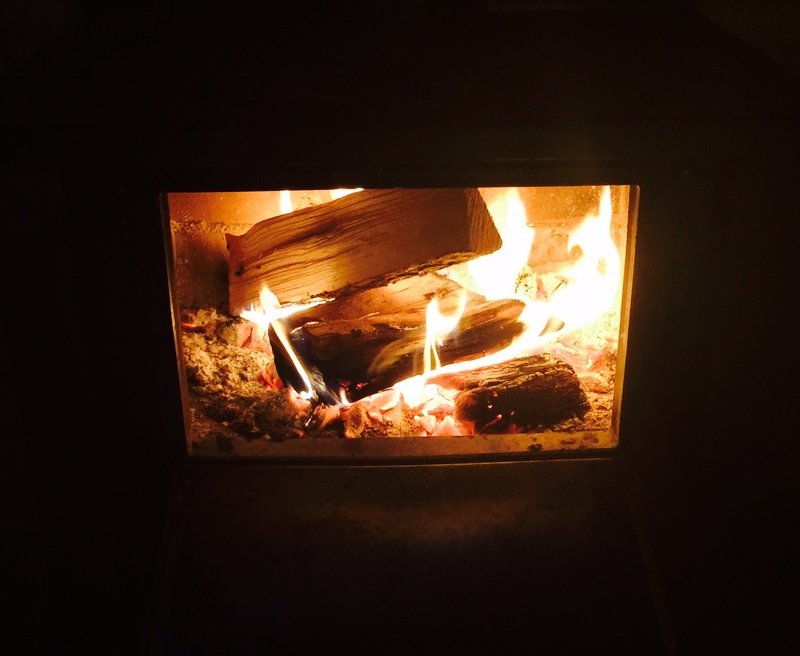 Now we start our mornings with a fire in the wood-burning stove, and it feels like a sun-salutation: a gesture of gratitude for another day, beginning with light and heat. There is deeper connection and appreciation for the wood, we remember touching it before. Yoga is a practice of remembering what you already know.